Sterling silver earrings I made with sea glass found at Smith's Point. Found every color except red and yellow. I used to find a lot of glass here but since they refurbished the beach, I haven't found any. Wanted to know if anyone else has found any this last month..
Oct 12, 2016 - I went to Smith's Point a few weeks ago and after spending hours there, I found ONE PIECE! It was clear and not even jewelry quality! 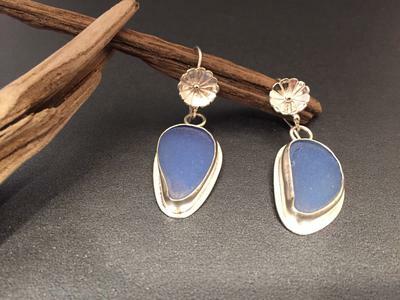 Nice sea glass and earrings!